BACtrack is a San Francisco that makes breathalyzers for police and anyone else who wants to keep track of their intoxication level, but thanks to a recent grant from the National Institutes of Health it has come up with a new wearable monitoring device. Like a Fitbit for booze, the Skyn device detects alcohol in a more discreet way than stuffing a tube into one’s mouth and blowing. It allows users to track their own consumption both in semi-real time (a bit of a delay for the alcohol to get processed and manifest in sweat) and, more importantly: over time in general (versus a one-time blow), to analyze drinking behavior and intoxication as a function of duration as well as intensity. Among other things, Skyn can warn you if you’re drinking too much to drive, or let a family member or friend know (via alerts) if you’ve broken a personal sobriety pledge. 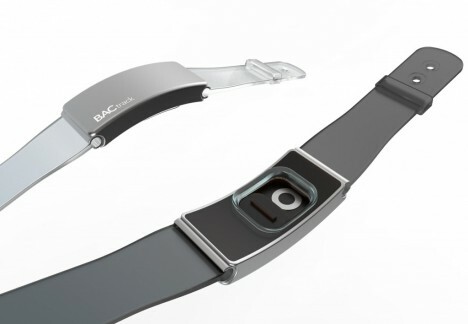 BACtrack’s transdermal alcohol sensing prototype device is made to be subtle and cool, something people will want to wear – they considered anklets and other placements, but wrists gave the best real-time monitoring and seemed most convenient to users. 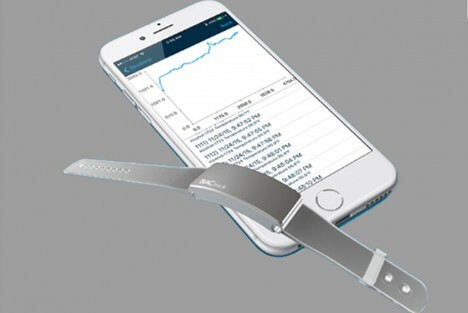 The prototypes was submitted to the National Institute on Alcohol Abuse and Alcoholism, a division of the NIH that ran a Wearable Alcohol Biosensor Challenge in search of a non-invasive monitoring wearable. Other entries included a color-changing tattoo and various wrist-mounted devices. The gadget is now waiting on FDA approval before starting pre-orders. See more in Clocks & Watches or under Gadgets. June, 2016.